If you have been following this series of articles you will know that I’ve gone to some lengths to expose the first libel against Henry Norris – that he somehow managed illicitly to fix the election of Arsenal into the first division in 1919. That was such a gross libel that has taken a number of articles to tell the full story. If you want to go through that tale in detail, the articles that tell the story are listed at the foot of this piece, along with a link to all the articles thus far in this series on Henry Norris at the Arsenal. But now on reaching the summer of 1920 we come up against the second major libel against Sir Henry Norris. It relates to the allegation by the Arsenal manager, Leslie Knighton, that Sir Henry so restricted the funds available to Knighton for transfers that he was reduced to using the brother-in-law of the club’s physiotherapist as a player, as there was no one else available. In this article I shall deal with the allegation, the way it was supported by an Arsenal player turned journalist, and how we can see that it is not just untrue, but actually a total reversal of the truth. Far from being just someone who happened to be around at the time, the man in question had already won the league twice in Scotland. But rather than isolate this piece from its historic context, I will also to cover the events of the summer of 1920 in this same article, as I believe that gives a clearer indication of what was going on at the time. (However if you wish skip to the outrageous slurs and libels committed by Knighton, and endlessly repeated as fact subsequently, you can scroll down to the heading “The Paterson Affair” below, which reveals the whole story). During the summer of 1920 Sir Henry Norris kept up his appearances at meetings including one noted by Sally Davis on 4 June at the Property Owners’ Protection Association, at Fulham Town Hall in which, seemingly as a unique event, he spoke about his sources of income. As Davis reports, Sir Henry stated that “his sole income during the past year had been rents from property he owned, and rented out, in Fulham”; the properties built by the Allen and Norris partnership, and rented out on leases. The next moment of significance was 11 June when the anti-gambling “Ready Money Football Betting Bill” which Sir Henry had introduced to Parliament as a private member’s bill, moved through its third reading, after its Committee stage in which detailed amendments can be made to cover all eventualities and possibilities. During his speech moving the third reading, Sir Henry showed the House of Commons one of the coupons which were its subject. These “coupons” were simply lists of fixtures with the odds offered which according to those opposed to this sort of gambling were hopelessly biased in favour of the bookie. It was argued in Parliament (among other things) that the outstanding characteristic of the British population was fair play, and this system of gambling was anything but fair. It was also pointed out that this system of gambling had already been banned in the Netherlands. The bill covered any person who “writes, prints, publishes or circulates any advertisement of any betting or tipsters business, whether such business is carried out in the UK or elsewhere,” and subjects them to penalties. The 14 June 1920 issue of the influential Athletic News gave fulsome praise to Sir Henry for his work on steering the bill through the Commons. It now moved onto the Lords where their Lordships who were fond of a flutter on the horses did all they could to hold the bill up. However the bill garnered enough support to make it through the procedures with a couple of days to spare. The following day Sir Henry was back in the Commons for the questions about the flooding in Lincolnshire and how the government was helping those affected and clearing up the after the floods. However from here on, much of the news of the day related to fighting in Northern Ireland. Five died in the rioting on 20 June, while on 24 June British troops were sent in to reinforce the garrison in Derry. And yet even with floods and insurrection, there were lighter moments that summer as the UK got its first roller coaster on 3 July at the amusement park in Margate, and there was the sign of the endless advance of technology and application as the airmail service between London and Amsterdam was launched on 5 July. A night time bus service was lauched in London the following month. But on the home front this was also a period of rampant nationalism as witness the fact that on 13 July the London County Council banned people who were not English nationals from working for the council – an act that was legal at the time. And still the troubles in Ireland continued as on 23 July 14 people died and over 100 were injured in continuing rioting and rebellion in Belfast. However there was social progress too. As we have noted, the General Election of 1918 was the first in which some women could vote, and this liberalisation of the laws continued as on 28 July the first women ever to serve on a jury in England were called up by the Quarter Sessions (the type of court replaced by the Crown Court in 1972). Yet still there were religious discrimination as by the end of the month the government was starting to prohibit the arrival of Catholics into the country who were thought possible be preparing to preach or speak to the population in Ireland. Finally on the last day of July the Communist Party of Great Britain was founded, and it held its first congress the following day. That may of course seem of no consequence now, but at the time the whole of western Europe was watching developments in fear of the uprising in Russia and eastern Europe being replicated in the west. And so we return to football as we move into August with players returning from their summer break to start training and play practice matches, ready for the earlier start to the season as established in 1919. Arsenal’s first game was to be on 28 August, which almost certainly meant there would be a Reds against Blues (first team against reserves) match at Highbury on 21 August, and quite possibly two other practice matches before that as well. (I suggest three games in all as we do know that this is what happened in 1913, this information being revealed through Arsenal having to use of other grounds for the games, as Highbury wasn’t yet ready). In August the Ready Money Football Betting Bill was given formal royal assent, rioting continued in Belfast – notably on 3 August – and there was growing talk about Britain declaring war on Russia in order to “rid Europe of the scourge of communism”. Indeed on 9 August the Labour Party, now feeling very empowered having made enormous gains in the post-war local elections, but also anxious not to lose its following on the ground to the Communist Party, announced it would call for a general strike if war was declared. Whether the thought of action against Russia was real, I am not sure, but clearly the government had more pressing matters on its mind in Ireland. On 13 August the Restoration of Order in Ireland Act was passed meaning that IRA activists could be tried by court martial rather than in the criminal courts, and three days later a new Firearms Act was passed in an attempt to restrict the use of weapons – particularly those that had been retained by soldiers returning from the first world war. The first real football news of the new season that was of interest to Arsenal was reported in Athletic News on 16 August 1920 – and it is here that we come to the story that gives us a significant insight into the truth behind the allegations against Sir Henry Norris made by Arsenal’s manager, Leslie Knighton, in his autobiography published some 26 years later. The story concerned which club the amateur player Dr James Paterson would play for, and so outrageous is the manipulation of the reporting of events Knighton for his own purpose, we might call this The Second Fabrication – the First Fabrication of course being the notion that Sir Henry Norris somehow manipulated Arsenal’s election to the first division by unfair means. The Athletic News story of 16 August reported that several clubs within London were seeking to register Dr James Paterson as a player – and in reality this could only mean Tottenham, Chelsea and Arsenal for there could be little chance that a player of Patterson’s pedigree would play for a second or third division club. However Paterson told the reporter of Athletic News that he felt his duties as a GP would mean that he would have to curtail his activities on the pitch, despite his illustrious past. Nevertheless the Athletic News man felt that Tottenham, having just been promoted and in need of bolstering their team for the First Division, could get his signature. So we now must ask, who was Dr Jimmy Paterson and what makes him so important to our story? Jimmy Paterson was born on 9 May 1891 in London to Scottish parents who returned to Scotland after his birth. Jimmy was educated in Glasgow, and started his league career playing for the amateur side Queen’s Park, before moving on to Rangers in 1910 where initially he played in the reserves while studying to be a doctor at the University of Glasgow. However his footballing talents quickly shone threw and while still studying he became a regular part of the first team playing at outside right as Rangers won the league. The next season he changed wings, and continued to play until he graduated in 1916 – the first division of Scottish league football, unlike that in England, not being suspended for the first world war. Dr Paterson then volunteered and was appointed Medical Officer to the 14th Battalion the London Regiment, the London Scottish, with the rank of Major, and he served his country with great distinction on the front line. When the war ended he returned to Glasgow and worked in a local hospital. And then, without any warning to the local media he turned out again for Rangers in September 1919 playing against Raith. In fact it seems he played without having gone back into training – an incredibly dangerous thing to do in terms of injuries that could be sustained, and reports of the match suggest he was very overweight. But through his sheer enthusiasm he won over the crowd, and indeed he scored. Rangers won the title again that year but Dr Paterson decided now was the time to move on. 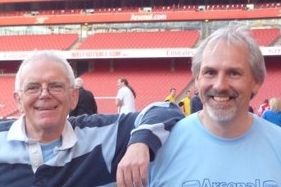 His brother-in-law, John Scott, was also a doctor, and he worked in London and by this time was Arsenal’s club doctor. Jimmy moved to London and with the housing shortage being what it was, naturally joined John in his house in Clapton. Whereupon it appears that John persuaded Jimmy to sign as an amateur for Arsenal, which he did in September 1920. Paterson made his debut for Arsenal on the left wing against Derby on 30 October 1920 and played 20 league matches that season and of course we shall be following his achievements in subsequent articles – but suffice to say here he was a considerable success – so much so that after he retired from the game, Knighton’s successor, a certain Herbert Chapman, persuaded Jimmy Paterson to return and play again for Arsenal. I’ve written elsewhere of how Leslie Knighton, the manager before Chapman, re-wrote Arsenal’s history for his own benefit, and here we see one such example. For in his autobiography, Knighton suggested that he was “forced” to take players from where ever he could find them, because of Norris’ parsimony, (a parsimonious approach which included the winding up of what Knighton claimed was his own extensive scouting network). Now Knighton’s team, as we have seen in previous articles, had done quite well in their first season back in the 1st Division, finishing a creditable 10th. And, through the intervention of Dr Paterson’s brother in law, Knighton was presented, without having to make any effort, with a forward who had played with distinction for and won the league twice with Rangers. What’s more he was being presented with a war hero, and a famous name – both of which were guaranteed to bring more attention to the club, and thus higher gate receipts. It was every manager’s dream. However in his autobiography Behind the Scenes in Big Football published in 1948 (that is 28 years after Paterson signed for Arsenal) Knighton wrote that during his time at Arsenal he was so short of players that he was “forced to bring in the brother in law of the club’s physio”, to make up the numbers. That brother-in-law was actually not the club’s physio at all but the club’s doctor, Dr John Scott, and that player was not just a passing relative, but one of the most revered players of the game in Scotland, who was being widely sought by both the other London first division teams, Jimmy Paterson. That comment by Knighton was utterly outrageous, bearing no relation to the facts, and a deliberate libel against Henry Norris. And yet, outrageous as it was this false report was then reiterated by ex-Arsenal player turned journalist Bernard Joy in his book Forward Arsenal! which was published after Joy’s retirement from the game in 1952 (22 years after the events in question). Worse, in the book Joy reported only that Paterson had played for Queens’ Park in Glasgow, ignoring the fact that Paterson won the league twice as an integral part of the Rangers team. This is not to suggest that Joy was an apologist for Knighton, but rather, as anyone who has read Joy’s book will know, this sort of error is typical of the book, and it reveals constantly that Joy did no research at all, let alone seek out any original documents. Rather he repeated simply what he had heard others say and became an apologist for the generation of Arsenal directors post-Norris: the Hill-Wood clan. Indeed we’ve already seen how Hill-Wood, who succeeded Norris as chairman of Arsenal refused to support Norris’ anti-gambling bill in Parliament. In short, Knighton and Joy both re-wrote history to support the evolving post-Norris view encouraged, I suspect, by Hill-Wood and others, that whatever happened in Norris’ time must have been bad. The man that Knighton in his autobiography claims he was “reduced to playing” – the brother-in-law of the physio, (whose entire contribution to football was that he had once played for Queens Park, according to Joy), was in reality one of the great heroes of Scottish football. What Knighton also omits to say in his book is that in 1920/1 under his management, Arsenal won only two of their first 11 games. Paterson then made his Arsenal début against Derby on 30 October 1920 and with Paterson in the side the club went unbeaten in the next seven, winning five. Not bad for a man just hired because he was a brother-in-law. In fact Paterson’s achievements did not end there for in March 1921 Paterson was selected for the Football League against the Scottish League, coincidentally played at Highbury. It was Paterson’s cross that led to the only goal scored by a man who was himself to become an Arsenal legend, Charlie Buchan. And if this set of details were not enough to suggest that Knighton was just looking for excuses and petty inventions that he felt he could throw out with impunity 23 years after he left the club and 14 years after Sir Henry had died, we might also remember that having retired from football at the end of the 1923/4 season, Dr Paterson was one year later persuaded by Herbert Chapman to play for Arsenal once again. Not exactly what we might expect Chapman to do if the man had been nothing more than a make-shift player used when none others were available. Indeed under Chapman Jimmy Paterson kept his place for the 20 February 1926 FA Cup game against Aston Villa away, and he played again on 24 February for the replay at Highbury in front of 71,446 – a game which Arsenal won 2-0, with Paterson scoring the first goal. He played his final game on 6 March 1926 away to Swansea. There is one more matter to cover prior to the start of the new football season for tragically on 27 August 1920 of the death of Hugh MacDonald was announced, at the age of just 36. Hugh signed for Arsenal on three separate occasions (not a record but still remarkable) retiring from football finally in 1913. And thus with that sad news we reach 28 August with the start of a new season. I shall consider the two games Arsenal played in August, along with the September matches in the next chapter. The evidence that reveals that Henry Norris did not in any way fix the election of Arsenal to the first division in 1919. 1 comment to Exposing the second libel against Henry Norris: the summer of 1920.